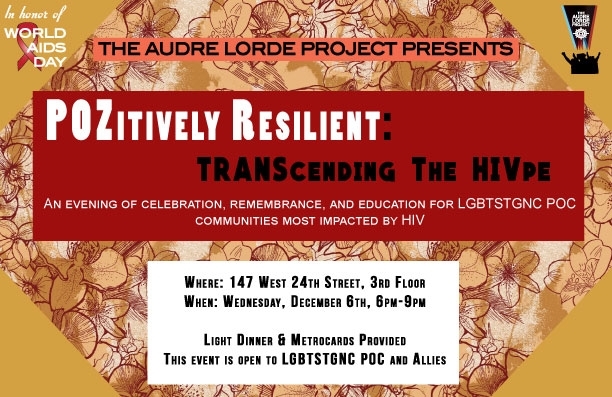 The Fifth Annual POZitively Resiilent is a community building night of entertainment, education, and mind-blowing realizations of the world we live in centering communities most impacted by HIV. This night will be comprised of performers, a panel, community resources, and giveaways! We will have light snacks and beverages available for the community. Have any unanswered questions regarding HIV, stigma, or transitions? Feel free to submit them in the comments, or e-mail Leslie LaRue at leslie@alp.org, or bring them to the event! Would you like to table or be a community partner for this event? or be a volunteer? Please e-mail Cleopatra at cleo@alp.org with the Subject line, POZitively Resilient. For any accessibility or logistical questions, please e-mail Cleopatra at cleo@alp.org.